Come see Nashville up close and personal on our 1- or 2-hour Segway tour. 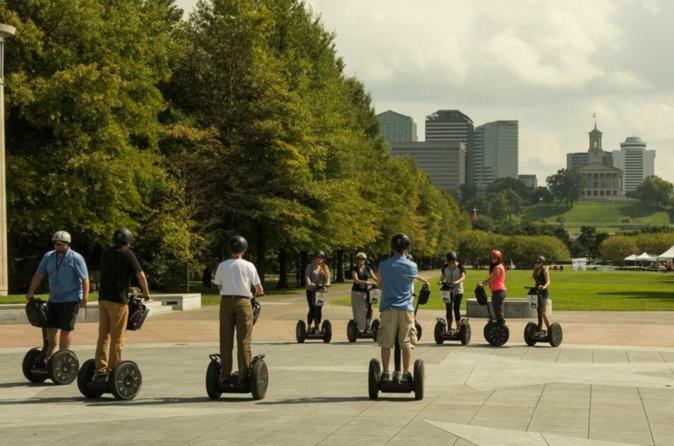 Explore Nashville with knowledgeable and experienced tour guides while riding your own Segway. Tours conveniently start and end just a block north of lower Broadway. Each tour begins with a 30-minute training session before embarking on your 1- or 2-hour adventure through downtown Nashville. You will glide past the most famous and iconic Nashville landmarks including the Schermerhorn Symphony Center, the Country Music Hall of Fame, Walk of Fame Park, Bridgestone Arena, the Ryman Auditorium, Bicentennial Capitol Mall State Park, and the Tennessee State Capitol. Our fun and unique touring options will leave you feeling like a Nashville insider. Begin your tour experience with an indoor Segway orientation session that lasts approximately 30 minutes. During your training you will watch a brief video that will introduce you to how the Segway operates. Each guest will be given one-on-one time with your guide to train on the Segway that will ease any nerves. Because we value your safety, all guests are required to wear helmets which will be provided. Of course, you are welcome to bring your own bike or skate helmet if you prefer. After training you will be asked to sign waivers. We ask that all guests wear flat, comfortable shoes (open- or close-toed is acceptable). After your training session, you will venture outside where staff members will assign you to your very own Segway. Each group member will receive their own radio and ear piece so that you can clearly hear your guide's safety instructions and narration of the tour. While outside on your two-wheeled contraption your guide will impart all their wisdom to you. You will take in the sights and sounds of Music City while learning about Nashville's music scene, history, sports, and architecture. After 2 hours of unparalleled fun, you will return back to our tour headquarters where you must part with your Segway and return to commuting in the normal, boring ways. Before saying goodbye, make sure you ask your guide's advice on where to eat. Special Offer - Book and save 19.68% compared to the local supplier's prices. Promo is only on the 1.5 Hour Tour! - Book Now!